Hill’s is a major producer of both dog and cat food, and has been in business for well over 100 years. Based out of Topeka, Kansas, the Hill’s company is presently a subsidiary of the Colgate-Palmolive Group, and markets a scientifically engineered diet that meets the veterinary requirements of your animal. Also very notable, Hill’s is one of the only dog food manufacturers to make prescription grade dog food which is made with extra care to prevent any cross contamination for dogs special needs – skin/food allergies, weight management, urinary care, and kidney care to name a few. Hill’s was founded in 1907 by Burton Hill, and actually began its life not as a pet food supplier but instead as a rendering works, disposing of the bodies of dead animals. By-products from this business were then used to produce food for local farm animals, which allowed the company to grow, eventually adding a mill in the 1930’s, and then expanding into food for human consumption a few years later. The real break for Hill’s, however, came in 1948 when Dr. Mark L. Morris, a veterinarian at the Raritan Hospital for Animals in Edison, NJ, contacted the company to make “Canine k/d”, the predecessor to today’s Science Diet, according to his standards. 20 years later, in 1968, the decision was made to sell this under the current name to veterinarians and pet professionals across the country, steadily adding new flavors and varieties to their lines. In 1976, the company was purchased by the Colgate-Palmolive Company, who further expanded Hill’s reach, making the product available in at least 86 countries and bringing in more than a billion dollars in revenue each year. Hill’s foods have an interesting dynamic, because while they proudly advertise that real chicken, lamb and salmon are always the first ingredients, what they don’t mention is that this is often a meat meal, rather than a whole meat like other brands might have. That said, they take care not to include chicken-byproduct or any artificial colors, flavors, or preservatives to their foods. They do add is extra vitamins, minerals, and amino acids, to fortify the food and make it more nutritious but in some of their product lines they do rely on grains and corn which is a negative. All of the foods are made in the United States, and utilize ingredients from North America, Europe, and New Zealand. Hill’s has several different product lines, but their most popular is the Science Diet formulas. Let’s take a look at their Science Diet Chicken & Barely Recipe to get a feel for the kinds of ingredients Hill’s uses. Chicken, Whole Grain Wheat, Cracked Pearled Barley, Whole Grain Sorghum, Whole Grain Corn, Corn Gluten Meal, Chicken Meal, Pork Fat, Chicken Liver Flavor, Dried Beet Pulp, Soybean Oil, Lactic Acid, Flaxseed, Potassium Chloride, Iodized Salt, Calcium Carbonate, Choline Chloride, Vitamins (Vitamin E Supplement, L-Ascorbyl-2-Polyphosphate (Source of Vitamin C), Niacin Supplement, Thiamine Mononitrate, Vitamin A Supplement, Calcium Pantothenate, Vitamin B12 Supplement,Pyridoxine Hydrochloride, Riboflavin Supplement, Biotin, Folic Acid, Vitamin D3 Supplement), Minerals (Ferrous Sulfate, Zinc Oxide, Copper Sulfate, Manganous Oxide, Calcium Iodate, Sodium Selenite), Oat Fiber, Taurine, Mixed Tocopherols for Freshness, Natural Flavors, Beta-Carotene, Apples, Broccoli, Carrots, Cranberries, Green Peas. You can see in the first 10 ingredients that the Science Diet product line uses grains and corn products fairly heavily. This formula also includes the mysterious “natural flavors”, which could really be anything. These ingredients do leave a bit to be desired especially if you’re looking to avoid corn and grains, but overall the nutrient breakdown is not bad. The 21% protein content is over the recommended minimum of 18% for adult dogs. We found this dog food to represent Hill’s products as a whole pretty well in terms of quality. Lets get into a breakdown of the lines, how they differ, and what they cost. Hill’s has only three main product lines, but each of them has several flavors and varieties within it, as well as canned foods and even treats. Hill’s foods can get remarkably specialized as well, catering even to a number of rare illnesses that some dogs might have. 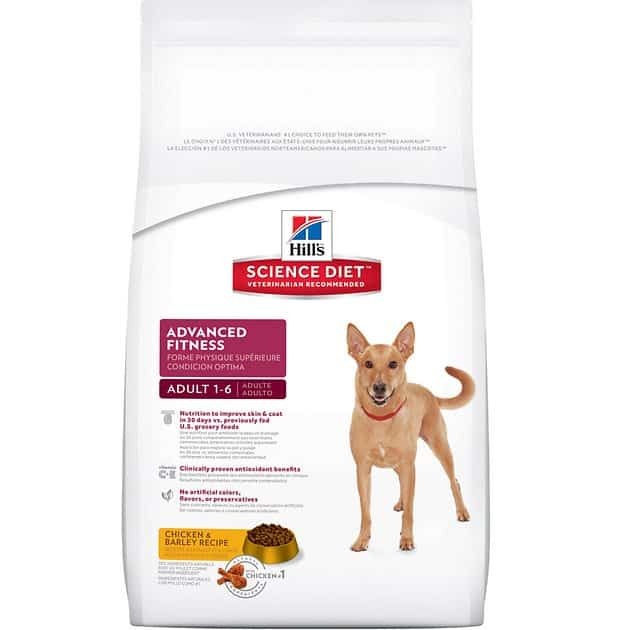 The standard recipe, Hll’s Science Diet is touted as “Veterinarian’s #1 Choice” and comes in a variety of flavors and varieties for dogs of all kinds. Most formulas rely heavily on grains and corn as we said above and the average cost of a bag is around $1.30-1.50 per pound. Prescription Diet produces a number of incredibly specialized products designed specifically to deal with specific health problems and their corresponding dietary needs. The Prescription Diet foods can get a bit costly and will require a vet’s prescription to buy, but for many animals these are the only real option, so the cost is worth it for the health and wellbeing of our pet. Cost ranges anywhere from $3-5 per pound – ouch! Some of these foods also run lower in protein content, so you may want to supplement your pets diet with some protein source like plain greek yogurt. Ideal balance is Hill’s foray into the natural pet food world, taking notes from other companies that enjoyed success embracing that trend. This is certainly a higher quality product that the standard line, and has a number of grain free varieties, but the options for this one are far less numerous that those available to the other two lines. That said, however, much like the other Hill’s lines, Ideal Balance also comes in canned and treat forms, and has options for all life stages and sizes. The average cost of Ideal Balance is around $2 per pound. Almost every pet food retailer, big and small, sells some Science Diet product, and a number of veterinarians likely carry it too, at least the Prescription line. Additionally, it can readily be found online, and is available for purchase from the Hill’s website, Amazon, and several other pages. The Prescription Diet, as the name suggests, will require a prescription. Because of this, this line is only available through a veterinarian or through a specialized retailed. The post Hill’s Dog Food Review appeared first on Woof Whiskers.